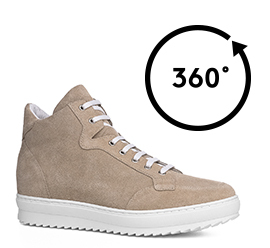 High-top elevated sneakers with velvety suede upper in desert beige and white super-light rubber sole. A must-have for the casual men who wants to increase his height up to 3.1 inches (10 cm) in total comfort. Made in Italy.